1989 Sea Ray 390 Express Cruiser Full Bodied Express Cruiser, one of the few Diesel Powered 39EC's on the market today. 375hp Caterpillar 3208's (Turbo's replaced, coolers cleaned, impellers replaced Fall of 2018). New Bimini top, new Eisenglass, Cockpit Bimini top (Spring of 2018). 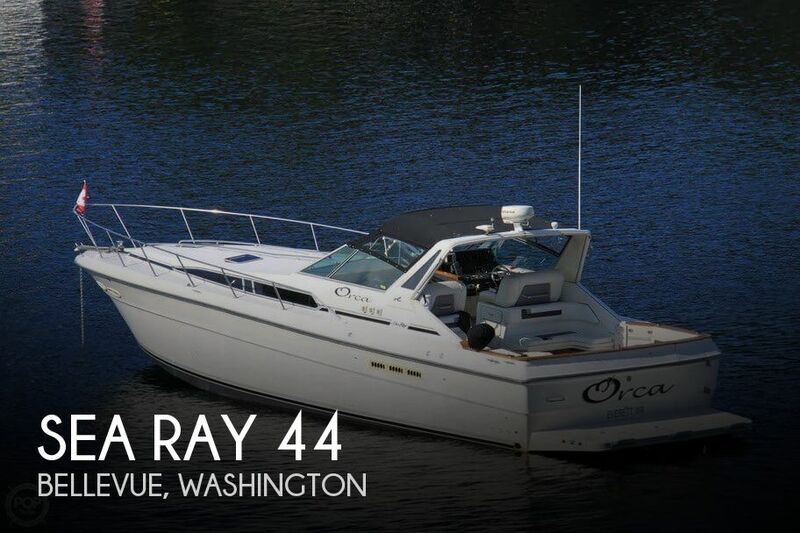 Valuable updates (tile and Vinyl Plank flooring, Flat screen TV's, Garmin color touchscreen GPS, etc) and a clean overall appearance compliment this nicely equipped boat. Located offsite, please feel free to call with questions. She has been cleaned, waxed, and buffed. Per the seller: Everything outside of the onboard vacuum is known to be in functioning order. The seller has regularly had the engine maintenance completed. Stock #174351 Offshore Power with plenty of room and amenities. 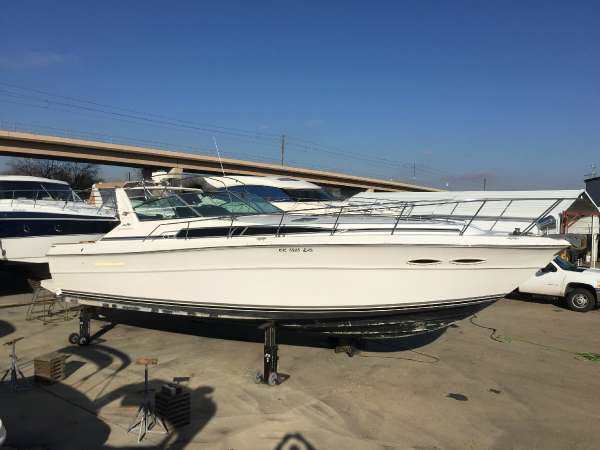 If you are in the market for an express cruiser, look no further than this 1989 Sea Ray 390 Express Cruiser, just reduced to $42,275 (offers encouraged). This vessel is located in Bellevue, Washington and is in great condition. She is also equipped with twin Mercruiser engines that have 2,000 hours. The boat is currently in the water with ceramic heaters in the cabin and Ice eaters in the water. The exterior will get further wash down once the winter wrap is off completely. Rebuilt CAT 3208TAs are barely broken in. Hours on the rebuilds are 425 Both engines were disassembled and all assemblies and sub assembly checked for tolerances and wear. The following parts were replaced and or rebuilt. New Pistons and piston rings. Cylinder heads were rebuilt with new exhaust and intake valves. Valve guides were bushed with bronze bushings. Connecting rods were rebushed and honed. Crank shaft and rod bearings were replaced as were front and rear oil seals. Injection pumps were rebuilt and new fuel injectors installed. Fresh and raw water pumps were rebuilt. Commercial Diesel,Amityville, NY was in business for forty years specializing in engine rebuilding and marine engine repairs. Cost of the engine rebuild was 30K not including removing and reinstalling the engines. SELLER WILL CONSIDER ALL OFFERS. Stock #171818 '87 Sea Ray 390 powered by Rebuilt (TOH) CATERPILLAR 3208TAs 375HP Each If you are in the market for an express cruiser, look no further than this 1987 Sea Ray 390 Express Cruiser - Rebuilt CAT Diesels, just reduced to $49,500 (offers encouraged). This vessel is located in Oceanside, New York and is in great condition. She is also equipped with twin Caterpillar engines that have 425 hours. Reason for selling is downsizing toys. This vessel is in exceptional condition for its age. The seller is the 3rd owner and the owner before him was a mechanic. The engine compartment is very clean and tidy. A new 16,000 BTU AC/Heat unit was installed in 2016 along with a digital controller. The canvas and Isinglass are only one year old and look great. The seller also added LED light inside and out along with underwater LEDs. Also completed in 2016: riser/Manifolds, generator renewed, water tank replaced, complete tune-up with new raw water pumps and hoses, trans serviced, batteries replaced, isolator replaced and the hot water tank was replaced. 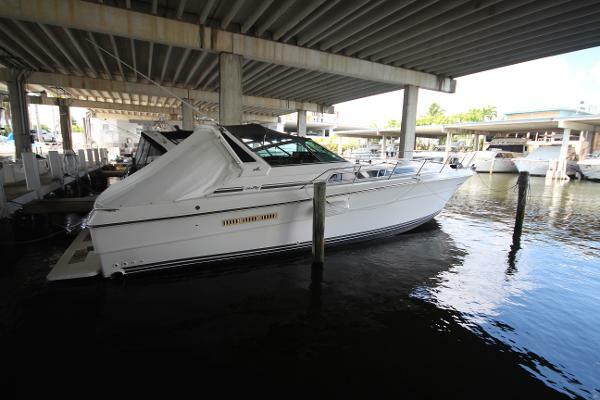 Stock #135839 Turn key 1988 Sea Ray 390 EC! Excellent condition and ready to go! 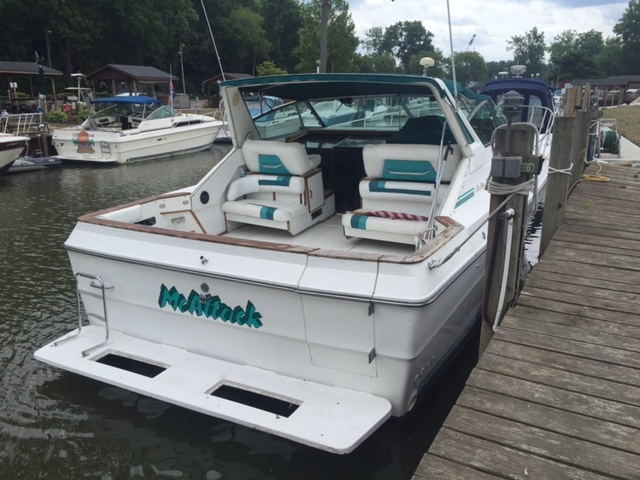 If you are in the market for an express cruiser, look no further than this 1988 Sea Ray 390 Express Cruiser, just reduced to $32,000 (offers encouraged). 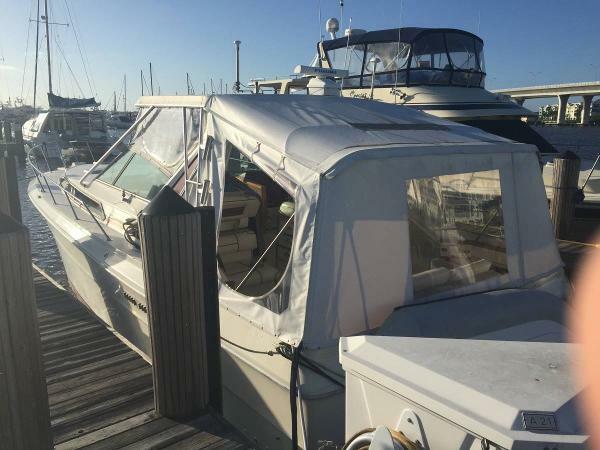 This vessel is located in Edgewater, New Jersey and is in great condition. She is also equipped with twin Mercruiser engines that have 530 hours. 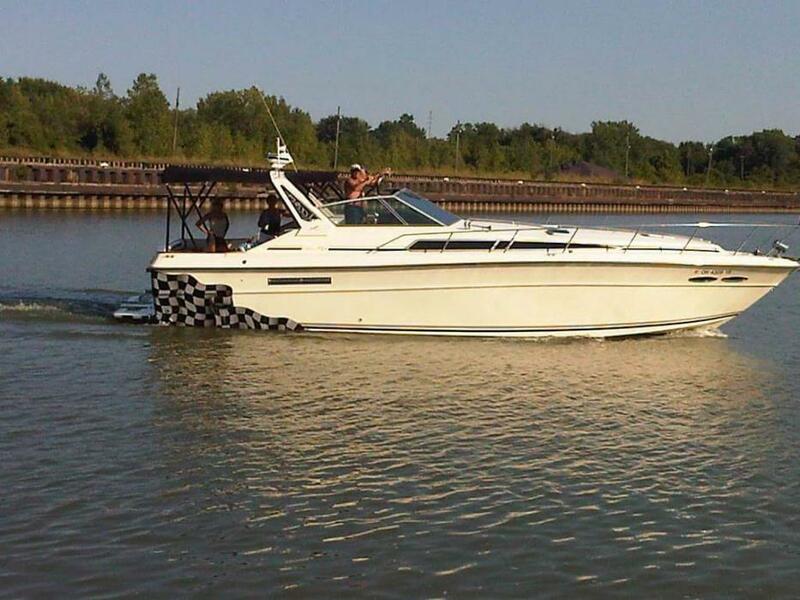 Reason for selling is looking to downsize to a 28' express cruiser (trades possible). This vessel is in the water but has not been de-winterized. The seller does not want to have the boat readied for season this year as she will not be using the boat. Any costs associated with preparing the boat for a water test will be at the expense of the buyer. Bring all offers accordingly. ** *REPOWERED IN 2006 WITH APPROXIMATELY 500 HOURS ON THE MOTORS* New seals around all port holes and windows recently. This is a nice project to have out of the way. Check out the archived spec sheet from Sea Ray. Great resources are always available for Sea Ray owners through many owners clubs and online forums. 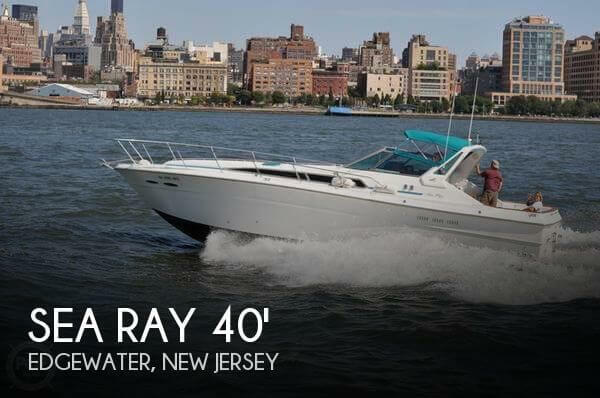 http://www.searay.com/boat_graphics/electronic_brochure/company1729/1C1_27_74DERNK53501.pdf Let's get you on the water now! POP Yachts has not yet been on this particular vessel. All information in this listing is believed to be accurate and correct but at present time has not been personally verified. We encourage all inquiries and questions relating to the boat, it's present condition, accuracy of details including but not limited to it's location, engine hours, service history, listing status and features. Stock #027851 BIG & SPACIOUS Express Cruiser. 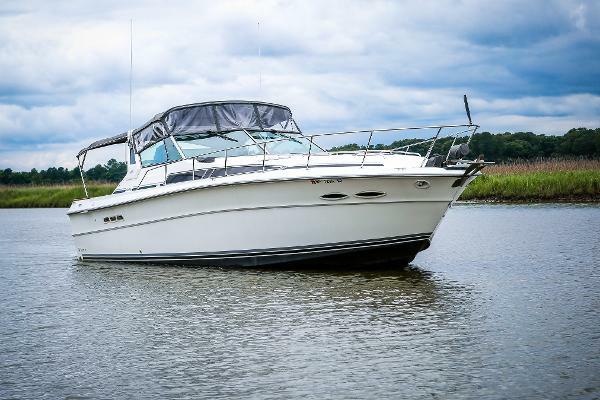 ONLY 500 HOURS, If you are in the market for an express cruiser, look no further than this 1986 Sea Ray 390 Express Cruiser, just reduced to $29,995 (offers encouraged). 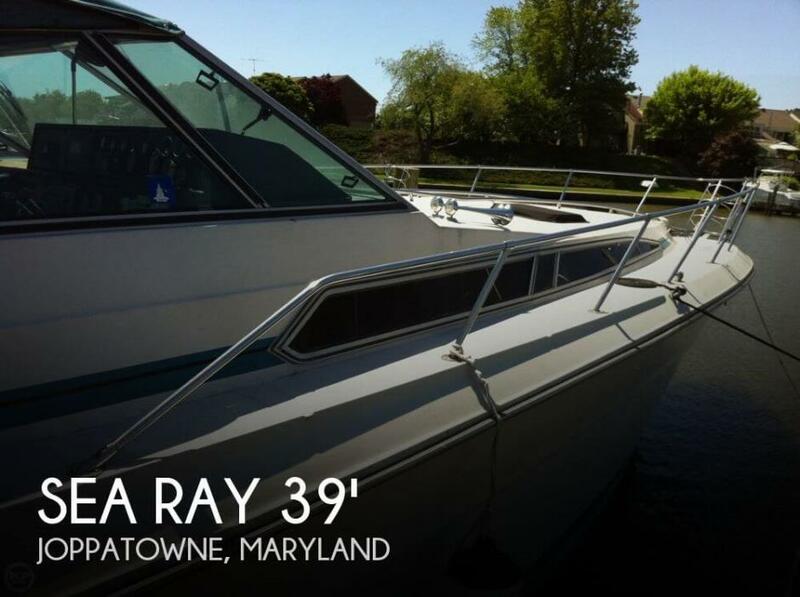 This vessel is located in Joppatowne, Maryland and is in good condition. She is also equipped with twin Mercruiser engines that have 500 hours. 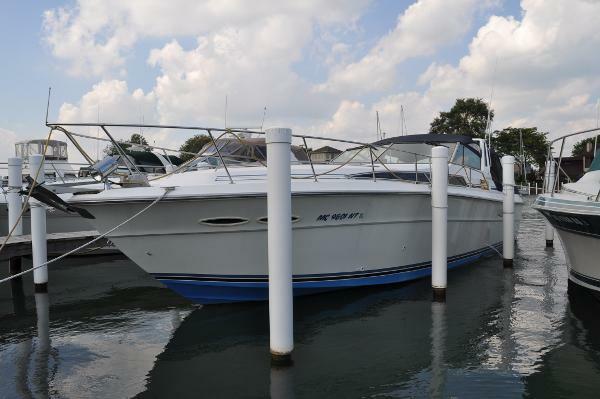 1989 Sea Ray 390 Express Cruiser This Sea Ray is an absolute GEM! Must See to fully appreciate! 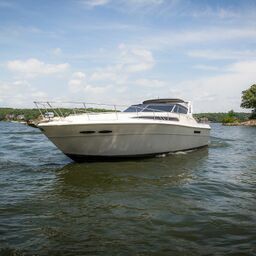 1989 Sea Ray 390 Express Cruiser powered by CAT 3208 Diesel straight shaft inboard engines with only 1450 original hours. Diesel generator with only 575 Original Hours! Original owners since new. Spared no expense to maintain her. Always kept under cover, in a wet slip at Cozy Cove Marina in Fort Lauderdale since the day these owners took delivery of Shazam. Away from the sun and always running the AC. The Paint shows extremely well, the interior shows extremely well too. The head liner is original and you would think its brand new. When you hop on board Shazam, you will honestly think you went through a time machine. She is in absolutely amazing condition inside and out. Everything works like it should, well cared for with love and shows. Owners are ready to move on and let her go to someone else ready to love Shazam like they always have. Call anytime for additional information or to schedule an appointment. LOA: 41'10" - Beam: 13'11" - Dry Weight: 16,400lbs. - Dead Rise: 19 Degree - Draft: 28" - Water Cap: 100 Gallons - Fuel Cap: 300 Gallons - Bridge Clearance: 9'6" Best Cruise is at 20 knots burning 20 Gallons an hour (both engines). Fresh new Bottom paint done in April of 2017. Ice Maker in Cockpit. Two AC Units inside Cabin. Two Newer TV Sets (one in Galley and one in Master Stateroom). Electric Stove. Microwave. Full sized Refrigerator and Freezer. New Carpet in Cabin. Two single sized berth. Couch has filler fusion for a double sized berth. Master statement has a King Sized bed. 1988 Sea Ray 390 Express Cruiser 1988 Sea Ray 390 Express Cruiser Twin 7.4 mercruiser inboards Westerbeke Generator 15 Foot Beam Full Kitchen Kitchenette Air Conditioner Queen Bed Two Bunk Beds Bath with Toilet, Sink and Shower Sea Rays most popular express cruiserMore Photos available! 1989 Sea Ray 390 Express Cruiser Preliminary listing--- more photos and details to follow. Extremely clean and well maintained by a knowledgeable owner. Priced based on condition and care. 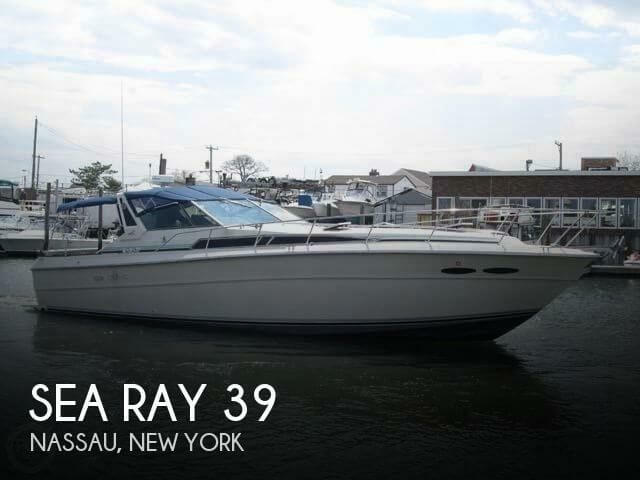 1985 Sea Ray 390 Express Cruiser With a long list of recent up-grades, this older yacht shows like a much newer vessel! New engines (2015) New Elbows and risers (Feb 2017) New A/C unit forward (2015) New hot water tank (2015) New fresh water tank (2015) Custom aluminum Bimini arch (2012) Auto pilot replaced 2012 New VacuFlush head (2014) Genset recently serviced and tuned Full cockpit enclosure And the list goes on and on! She's a popular design, a roomy lay-out and in nice shape. She's the perfect family boat with everything you'd want for a weekend getaway or extended cruise to the Bahamas or to do the Great Loop! 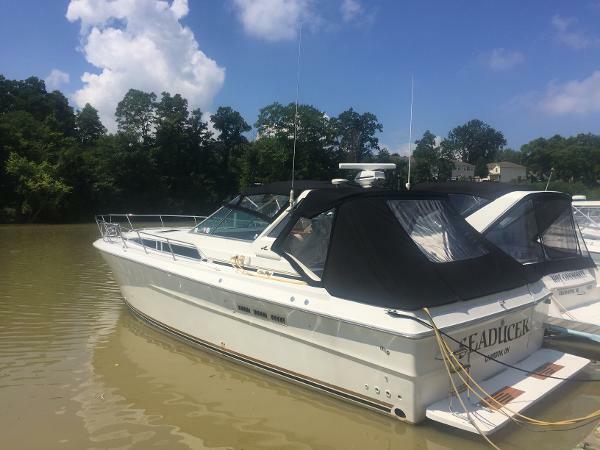 1988 Sea Ray 390 Express Cruiser Sundancer If you are looking for a well maintained cruiser with 2 private staterooms, head with separate shower stall, huge salon and galley, camper canvas, bimini top, forward sun pad, etc. Many updates have been made: TV's, Fridge, Swim platform, etc. The cockpit on this boat is huge. Recently added cockpit carpet, New bottom paint. 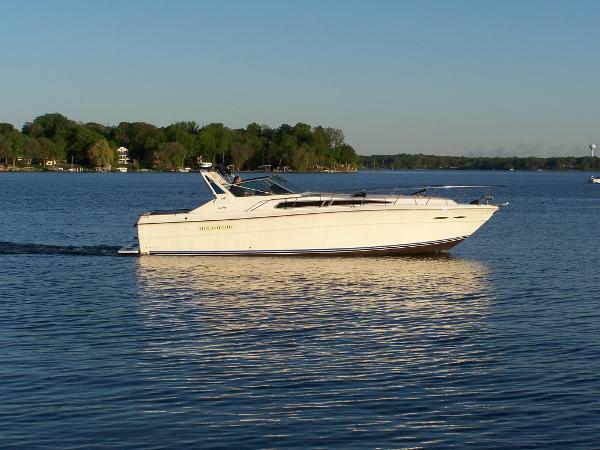 - Gen, A/C, Canvas, 2 staterooms, head w/ separate shower, Twin 340HP inboards, huge extended swim platform! - Generator, A/C and Heat, many updates. 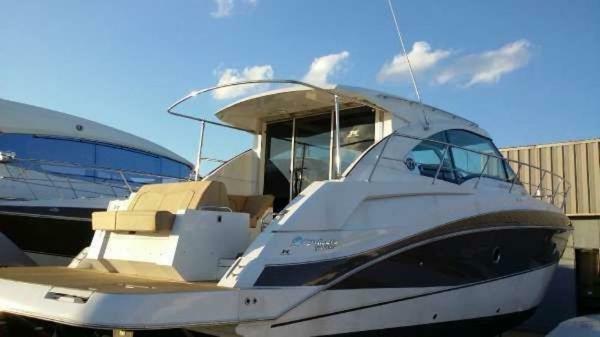 HUGE COCKPIT, 2 Separate Staterooms, separate shower stall in head, forward sun pad, camper canvas, bimini, etc..
1989 Sea Ray 390 Express Cruiser (CURRENT OWNER OF 15-YEARS) 1989 SEA RAY 390 EXPRESS CRUISERS -- PLEASE SEE FULL SPECS FOR COMPLETE LISTING DETAILS. Freshwater / Great Lakes boat since new this vessel features Twin MerCruiser 454-cid 340-hp Gas Inboard Engine's with 698 original hours. Notable features include but are not limited to the following: Air-Conditioning & Heat (2-Units), Head (Vacuflush) w/Vanity/Sink/Stall-Shower, Central Vacuum, 7.5kw Quicksilver Generator, Windlass Anchor, Camper-Top Canvas Package w/Screens, AM/FM Stereo System, Swim Platform w/Boarding Ladder, and MUCH more! Broker Notes: Sale includes owners manuals. The PowerBoat Guide had this to say: The 390 Express Cruiser turned out to be one of the most popular boats ever built by Sea Ray. First of the big production express boats when she came out in 1984, her sleek lines and European styling--tame by today's design standards--made a lasting impression on the mid-1980's sport boat market. Below, her expansive two-stateroom interior is arranged with a queen berth forward and a combined galley-and-breakfast bar facing the curved settee in the salon. The guest stateroom is unique: it's separated from the salon by a retractable mirrored bulkhead. Slide it away, convert the bunk berths into a sofa, and the area actually becomes part of the main cabin. The 390's interior was updated twice over the years changing from the original wood grain mica to teak in 1986, and to a white-mica/teak-trim decor in 1988. Topside, the single-level cockpit is huge with seating for as many as eight passengers.